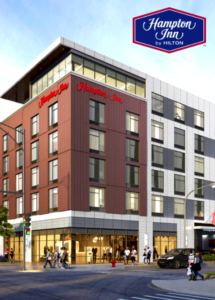 The Hampton Inn By Hilton Chicago North-Loyola Station has officially opened its doors. Located at 1209 Albion Ave., the 145-room hotel is directly across the street from Loyola University campus and a variety of local restaurants. The hotel is infused with local photography and artwork, displaying the property’s connection and support to its own community. Families and business travelers will enjoy Chicago’s key tourist attractions, which are ideally located near the property. Guests won’t have to leave the property to enjoy sweeping views of Lake Michigan from its stylish rooftop terrace, or to enjoy a drink from its relaxed lobby bar. Hampton Inn by Hilton Chicago North-Loyola Station is within walking distance to the Red Line, Yellow Line and Purple Line train stations connecting travelers to popular area attractions such as Wrigley Field, Lincoln Park Zoo and Northwestern University. Designed as an extension of the guest room with a variety of seating and lighting options for leisure and business travelers, the new hotel features the Perfect Mix Lobby. Here, guests will receive a fresh start to each day with a complimentary hot breakfast, which includes a variety of options as well as many health-conscious offerings. They will also find an on-the-go food and beverage shop filled with snacks, toiletries, local merchandise and drinks for purchase. Hampton Inn by Hilton Chicago North-Loyola Station participates in Hilton’s award-winning customer loyalty program, Hilton HHonors®. Hilton HHonors members who book directly through preferred Hilton channels have access to benefits including an exclusive member discount, free standard Wi-Fi, as well as digital amenities where HHonors members can check-in, choose their room, and access their room using a Digital Key. For more information or to make reservations, please visit Hampton Inn by Hilton Chicago North-Loyola Station or call +1 312 265 5800.